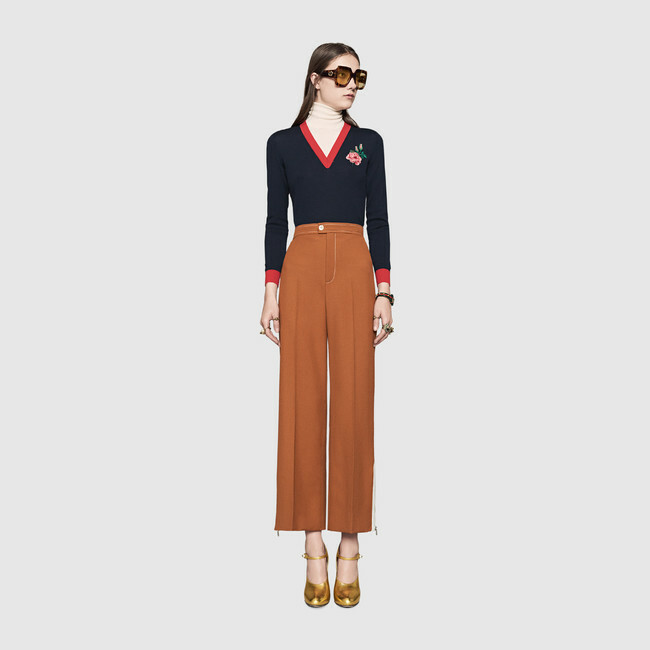 Modern, stylish and luxurious Italian brand of fashion and leathered goods, Gucci has been an evergreen favourite of celebrities and other fashionistas looking for high quality elegant and unique designs. With the year commencing towards its final lap, we are enlisting the top 10 Gucci product that stole the show with its one of a kind design and glamorous appeal. 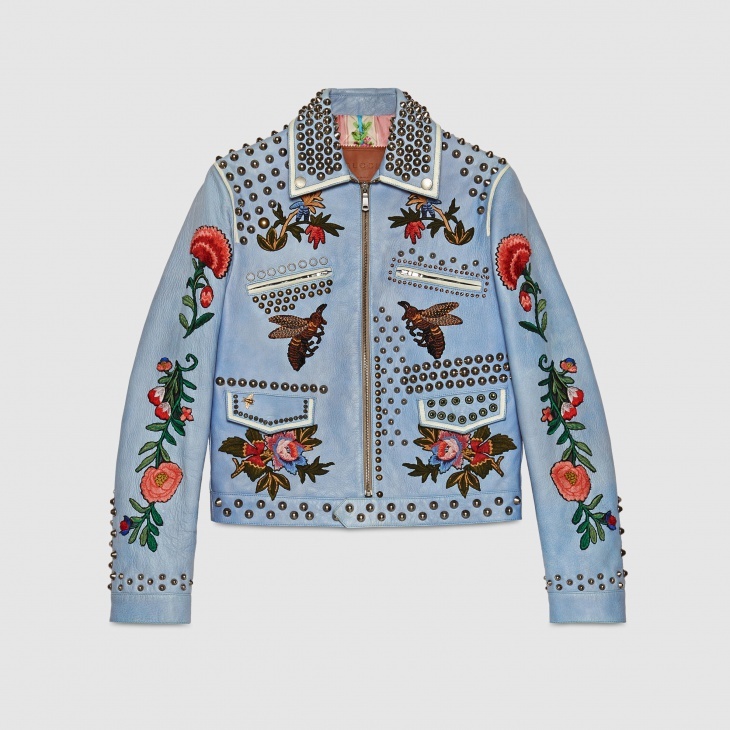 This embroidered leather jacket stands close to the look of the brand with the bold print and studded details. Blue leather carrying hand painted details and quilted tapestry print lining makes the look of the jacket refined and classy. 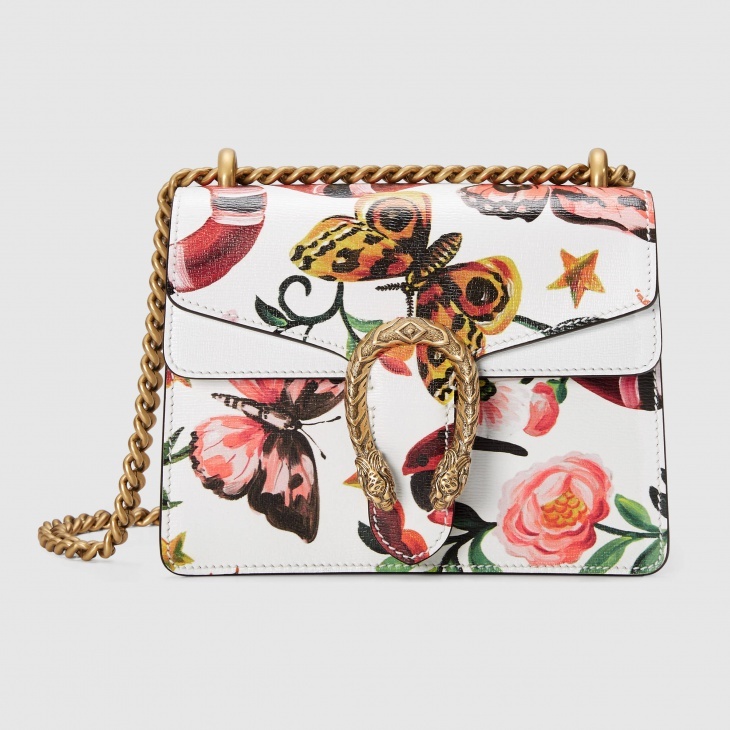 With florals running high this season, the floral print Gucci leather shoulder bag holds a strong charisma to be the most fashionable addition to your bag collection. Elegant and perfectly balanced in colour, the bag is certainly a charming piece to get your hands on this season. A multi-colored t-strap pump with subtle colours like brown, beige, blue and white infused in leather make the platform pump a classy and a slightly more comfortable option for heels. A cashmere wool top, studded with layers of crystals, pearls and velvet details around the neck make the embellishment the focal point of the top. Very exquisite and high quality in its appeal, it is one top we would suggest you to invest in. An elegant and shiny python coat with self-belt and fitted silhouette paired with oversized sleeves, a trend that was seen multiple times in Fall-Winter fashion show runway. The coat is attached with single back vent and pearl buttons with fish embroidery on the inside. 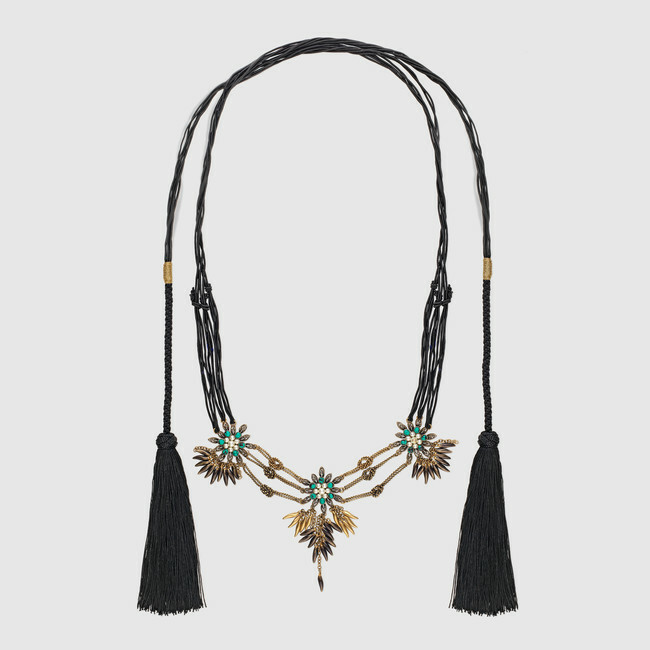 This necklace with braided nylon cord wraps around the neck with long tassels. The flower detail embellishment is affixed with pearl beads, stones and enamelled metal charms. In turquoise and dark yellow colour the beads hold a metallic and aged gold finish. 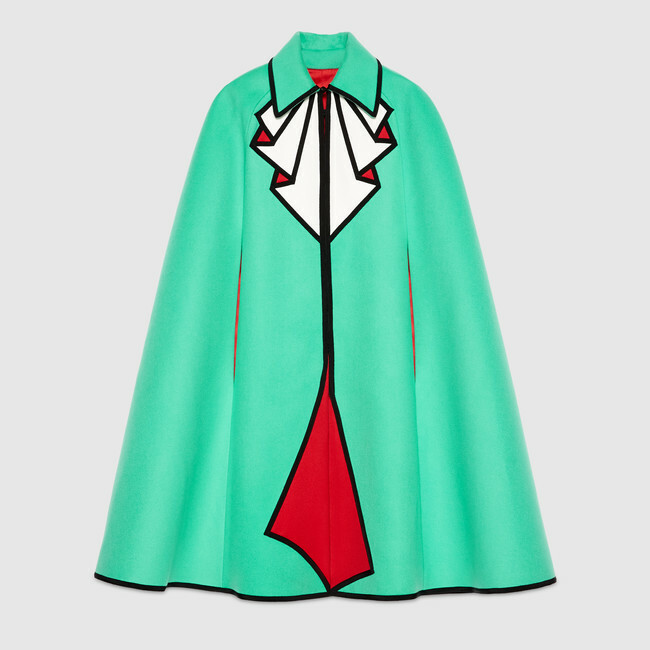 The woollen cape with a Trompe L’oeil print on the front makes the cape enjoy a 3-dimensional effect in subtle shades of black and white complemented with the vibrant colour green on the rest of the cape. 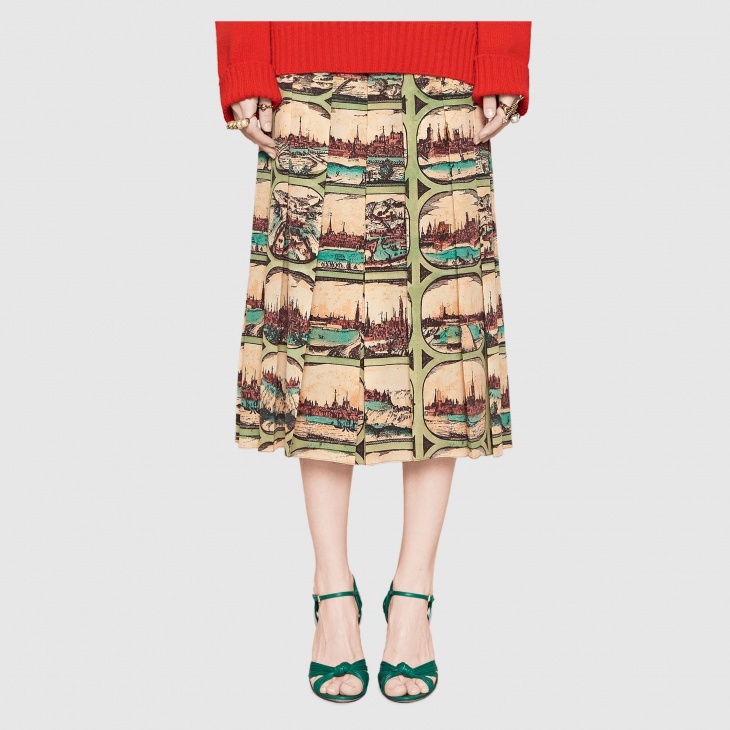 This knee length postcard printed pleated skirt depicts different cities with a vintage feel. With a complementary colour combination, the skirt shines out with its design and pattern. Cropped brown wool pants with a contrasting trim was a favourite in the Fall Winter 2016 runway. If you are looking for one of a kind jacquard jackets this renaissance inspired coat in metallic jacquard with mink fur details and extended puff sleeves is surely one of the trendiest options to go for. 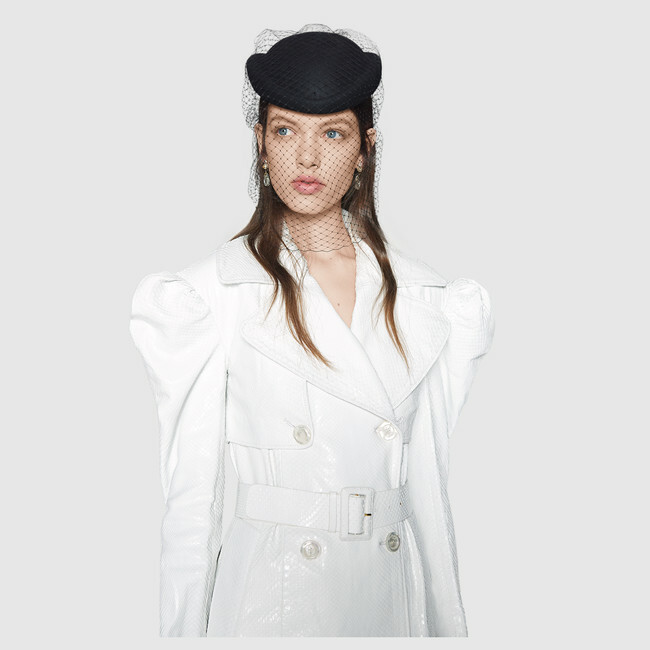 Cropped and boxy in its shape the jacket is best to bring an instant glamorous transformation to your outfit. With Gucci being the leading favourite this season, opt for any one of the design to bring a dazzling transformation to your wardrobe collection.